2,920 miles…that is the number of miles that Charlie Warthan, my dad and myself drove over the Thanksgiving week; we left late in the afternoon of November 22 and made it all the way to Regent, North Dakota by late in the afternoon the next day. We checked into the Enchanted Castle…which was a very interesting hotel in the very small North Dakota town of Regent and met Ivan Williams. Ivan is the older brother of my good friend Kenny Williams and would play host the next morning to the three of us as we moved south and east in pursuit of rooster pheasants. We followed Ivan about 15 minutes to a long grassy swale that ran about a mile and a half through the middle of a harvested cornfield; dad let me, Charlie, Ivan, his Friend Jennifer…oh, and 6 German Shorthairs out and we headed northwest towards the other end where dad would drop the truck and block for us. The cover was very thin due to a 30 inch snowfall in mid-October…in fact most of what would have held birds was flattened and lying in several inches of frozen rain and snow melt. With the wind blowing, thin cover and it being late in the season…the birds were very skittish, every bird we moved left the country well before we were close enough for a shot and this left us scratching our heads and left me wondering how tough it was going to be this week to harvest some birds. Ivan led us to yet another spot about 3 miles to the south. This was a beautiful piece of CRP grass, about 60 acres in total; we quietly let a few of the shorthairs out of the trailer and moved around the perimeter of the field. As we neared the northeast corner I saw about 5 birds evacuate and knew that we had caught a few birds in the cover…the next few minutes was very exciting as one bird after another blew out of the cover and when it was all said and done we had harvested 5 pheasants and all four of us had shot at least one bird. I was most impressed with Jennifer who was my wing woman…Royale was on her game and pinned a rooster right on the edge of the field, I snapped a few photos and gave Jen the go ahead-she moved forward as a big rooster rocketed skyward. I was getting ready to mount my gun when I heard a pop from Jen’s 20 gauge and watched as the bird folded right in front of Macy who quickly retrieved the bird to hand. Ivan unfortunately had to get back to work and this left our Indiana trio looking for birds on our own. We would be hunting PLOTS (Public Land Open to Sportsmen) acreage for the next three days. If you are not familiar with the program…the farmer is paid $11 per acre to allow hunters like us the privilege of hunting their land. Many of the western pheasant states have such programs that are quite popular because it allows non-residents like us to grab a copy of the atlas, drive to a field…then get out and hunt…no permission is necessary. While the program is great in theory…there were clearly some issues this season. 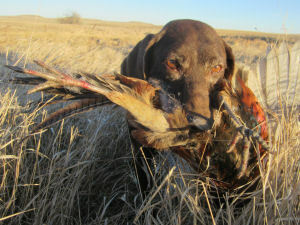 First off the pheasant population in North Dakota (and throughout the pheasant belt) was way down due to many factors. One of the main issues in ND was the fact that about 50% of their corn was still standing and when there is standing corn…that is where the pheasants are going to be. Another major problem was the fact that haying or cutting the grass on these PLOTS acres was released this past summer…creating a major issue as the cover for the birds had been baled, rolled and stacked for future agricultural use! The combination of these three factors led to some very tough hunting. Sometimes persistence is the key. 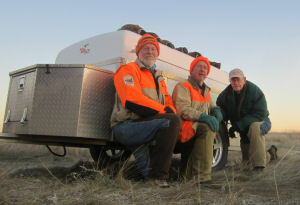 Our last morning found the three of us east of the Missouri River, about 10 miles southeast of Linton, North Dakota. The first three days had produced several birds and many other nice opportunities…but I knew that we would need to find some thick cover in close proximity to corn. Our second PLOTS section was just what the doctor ordered as it was a cattail marsh located adjacent to a picked cornfield. Charlie released his male shorthair Quincy and I put Cedar and Macy down; we moved straight towards the closest edge and before the dogs hit the cover…three hens exploded out of the cover. Immediately my pair locked up and a long tailed rooster made his way over the frozen lake, I snapped my 12 gauge to my shoulder, squeezed the trigger and watch as the bird spun down upon the ice…Cedar made a great retrieve; I knew that at 14 years old…he might not have that many more retrieves left! Quincy gave Charlie quite the treat as three times he locked in on point in the heavy cattails; the only way to know was to listen for his beeper collar chirp and fight your way through the head high cover. The first two points were hen points however the third time was the charm as a big ole rooster exploded just off Quincy’s nose and Charlie made short work of it dropping it with a 12 gauge load of Remington Express heavy 5’s. Throughout the day we continued to get great dog work and eventually harvested our limit of 6 pheasants…and I am proud to say…without missing a shot. It was one of those days that all of us will long remember as under cold, sunny skies we succeeded in our pursuit of the king of game birds…all while Enjoying the Great Outdoors. I am so glad that Dad got the opportunity to go with you. I know that he really loves the thrill of a good hunt. I hope you have many more exciting hunts!